Grown with the utmost attention to quality at every stage: hand-picked, air dried and small batch roasted to perfection just prior to shipping. 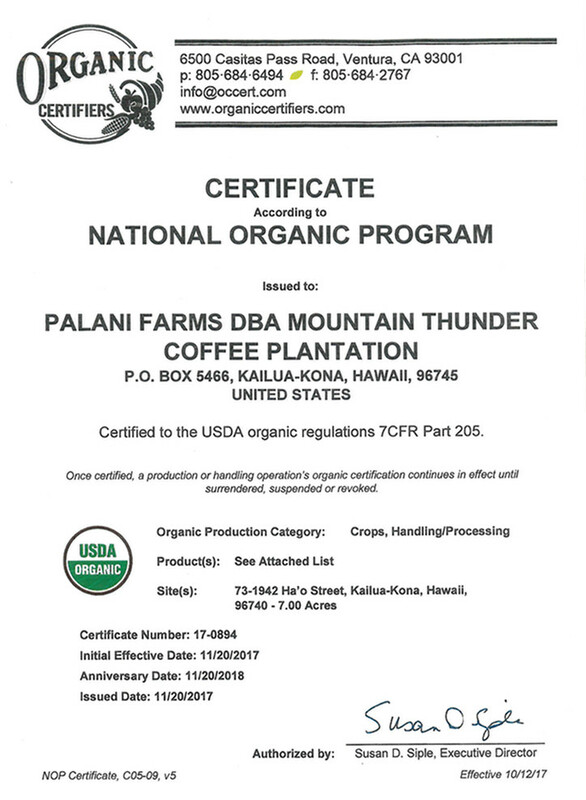 USDA Certified Organic Kona Coffee Mountain Thunder is proud to offer Certified Organic coffee. Grown in strict adherence to organic coffee farming principles, organic Kona coffee is grown without the use of non-organic herbicides, pesticides or fertilizers. Additionally, the coffee is processed at our Mountain Thunder Coffee Plantation in facilities which are also USDA Certified Organic, which means from farm to coffee bag, these coffees have been grown, processed, roasted and packaged separately from all non-organic coffees. Our Hawaiian teas are all grown on Hawaii Island. Our Mamaki Tea is a caffeine-free tea, rich in antioxidants and believed to offer many health benefits. It is grown on a USDA Certified Organic farm. Our Kona Coffee Cherry Tea comes from the dried skin of the coffee fruit. It’s known for its sweet taste and antioxidant properties. Personal Care Products from Mountain Thunder. Coffee scrubs, salt scrubs, body butters and coffee hydrosol mist. Mugs, Coffee Storage, and Cup of Aloha Book. All of our one pound 100% Kona Cofffee products. All of our half pound 100% Kona Coffee products. Sample our coffees in these packs of four, 2 ounce bags. Chocolate covered beans are here for a limited time. Get them while they're available.